These two libation cups are exceptionally rare. They are of almost unparalleled quality. 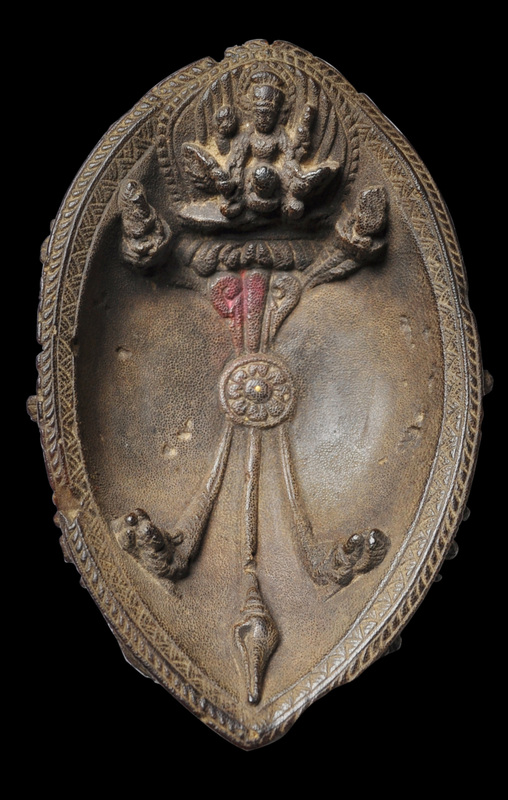 Both have undoubted royal provenance: one is inscribed to two past kings of Patan; and the other is decorated with iconography that was a royal prerogative. 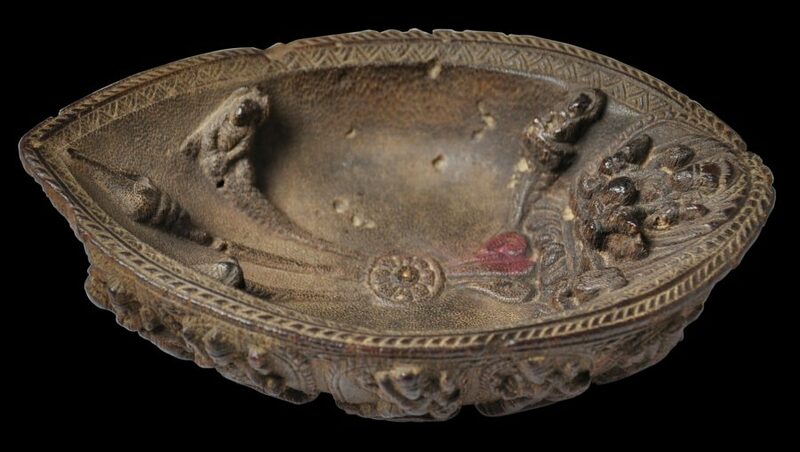 There is a related but less elaborate example of the larger one in London’s Victoria & Albert Museum that was presented to King George V by the King of Nepal in 1911. 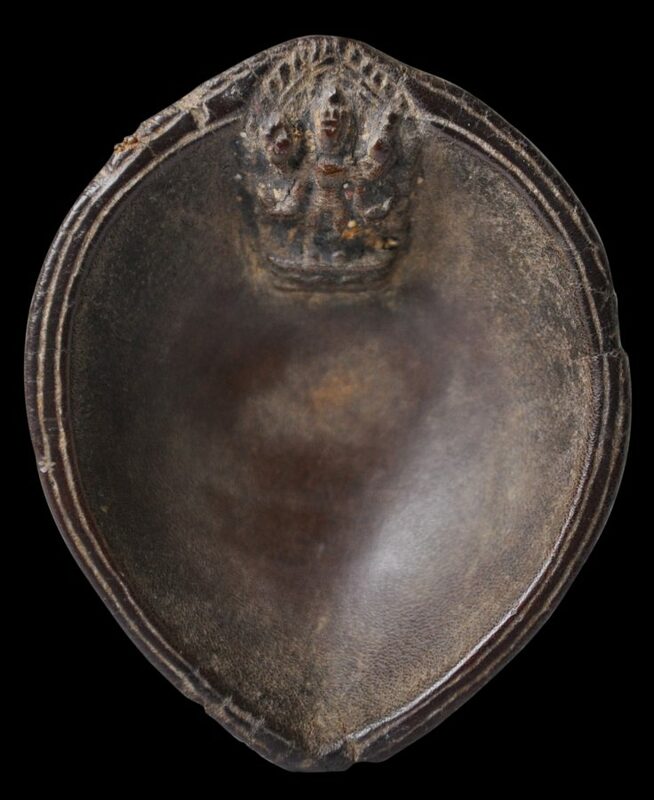 This example is on loan to the V&A from HM Queen Elizabeth. 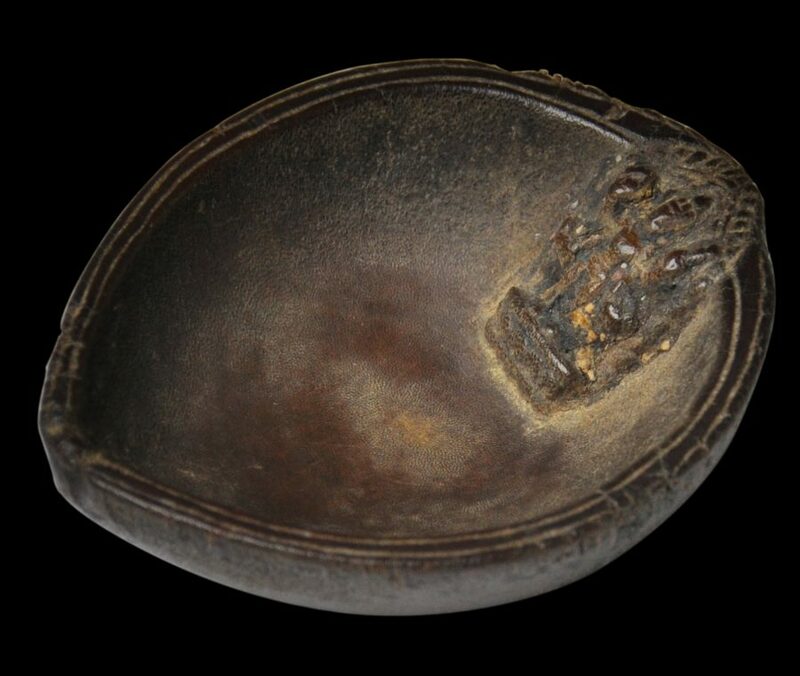 A very similar example to that here was sold at Christie’s Amsterdam in 1994 as lot 43. (Click here to see the catalogue entry; the image is no longer available.) 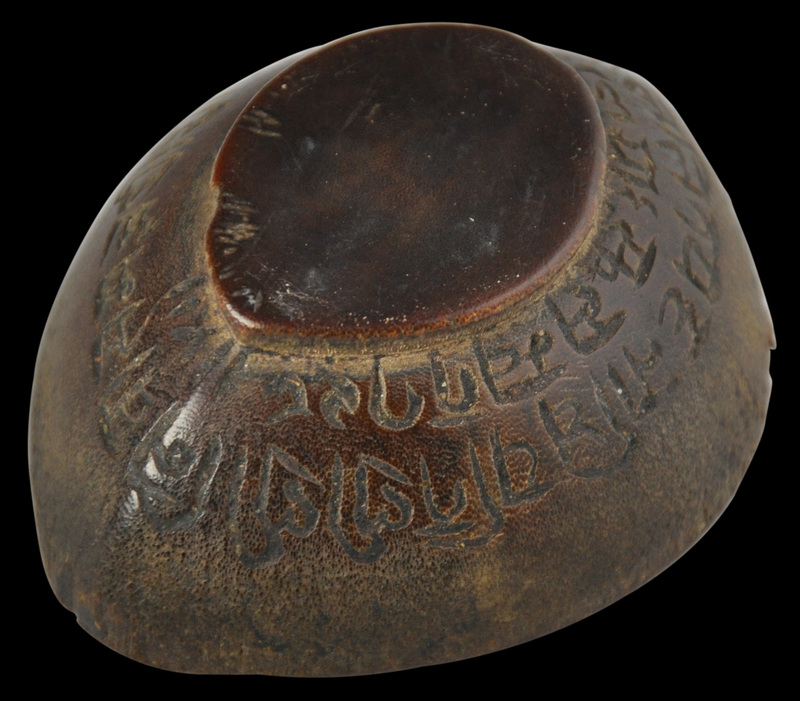 The Christie’s example had been on loan to the Israel Museum, Jerusalem, from 1988 to 1993. Together with the example, here these three of this larger type are the only known examples in the Western world. 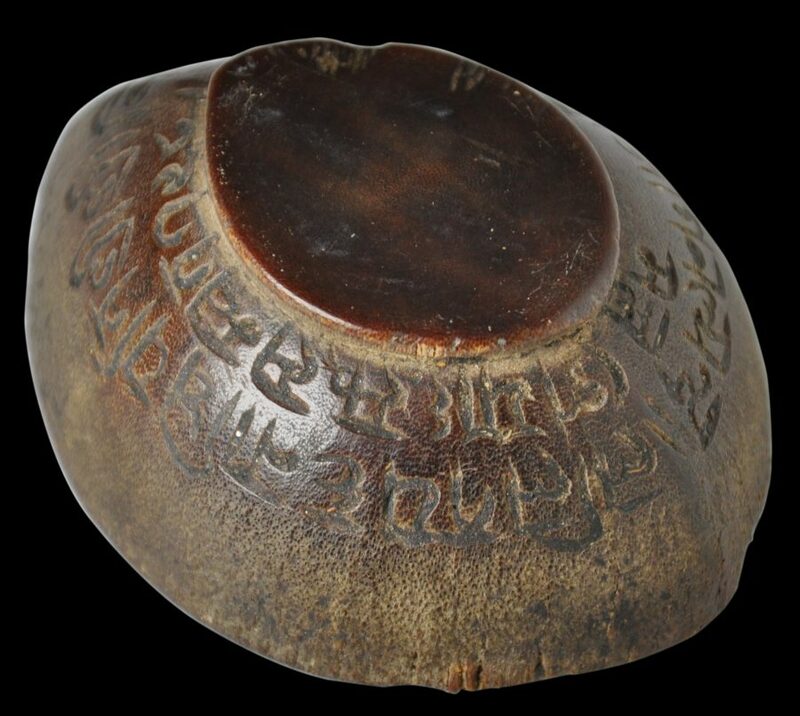 This rare libation cup, of tear-shaped form, has been carved from rhinoceros horn and dates to the latter part of the 17th century. 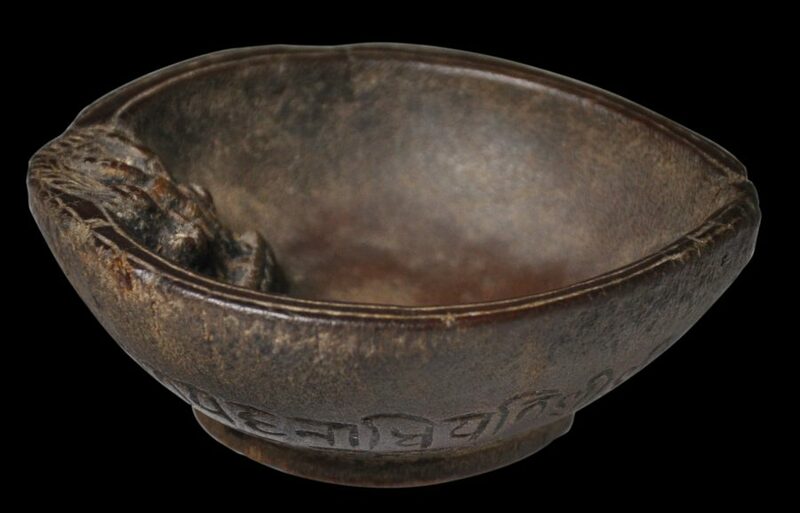 Such a cup would have been used to pour consecrated lustral water over religious images. 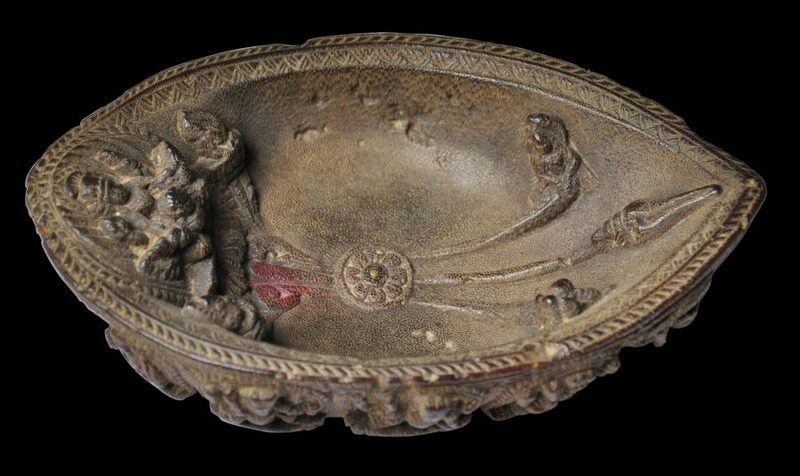 The inside is carved with a dominant image of Vishnu, crowned an astride hisvahana, Garuda. 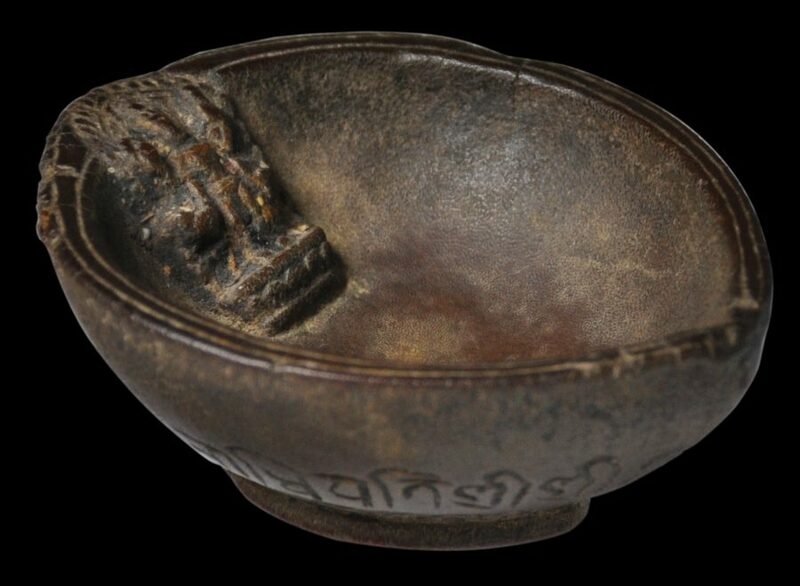 The royal provenance of this cup is suggested by the material from which it is made and this use of Vishnu: the kings of Nepal were regarded as incarnations of Vishnu. There are also secondary images of Vishnu’s consorts. 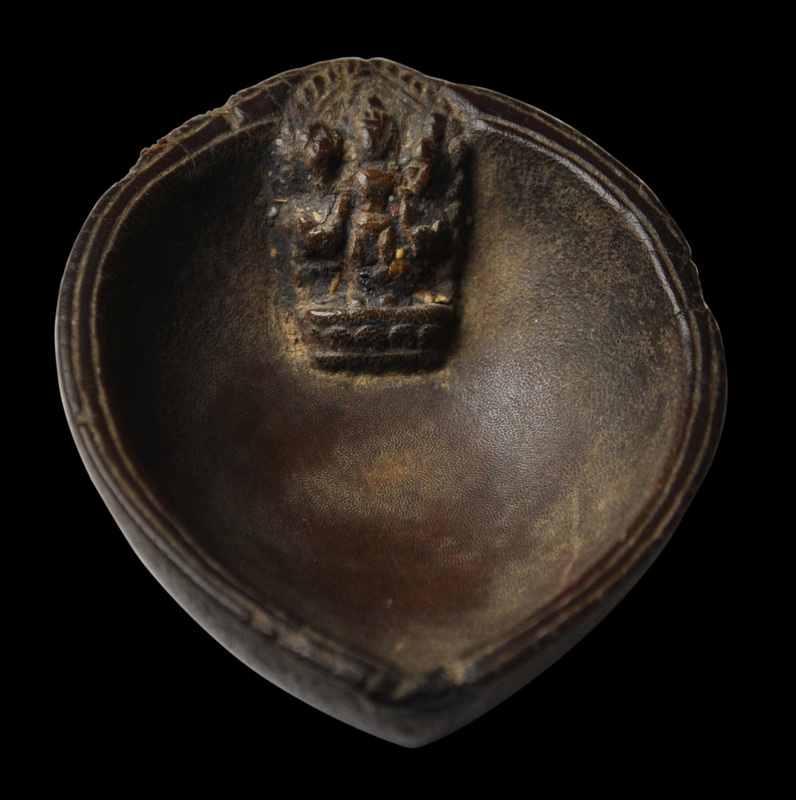 The centre of interior of the cup is carved with a lotus motif which has a small silver pin at its centre. 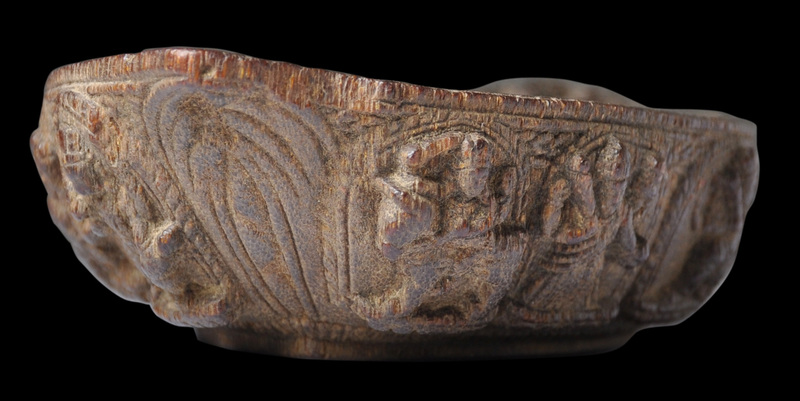 The interior of the pouring end of the cup is carved with two other deities in high relief and a central shanka or conch motif. The insider upper border is carved in light relief with a chevron band. The sides are carved in high relief with eleven cartouches or panels of different deities including Ganesh, Krishna, the four-armed Balarama, and Kalkin on his horse. All stand on a lotus-base and within a flaming aureole. The cup has traces of red vermilion powder used inpuja. It has a splendid patina. There are no major chips and no repairs. The contours have been rounded and softened from use and age. This smaller libation cup of tear-shaped form is made either from rhinoceros horn or possibly rhinoceros toenail. The interior of the non-pouring end is carved in relief with a figure of Vishnu standing on a lotus petal pedestal and surrounded by a flaming aureole. 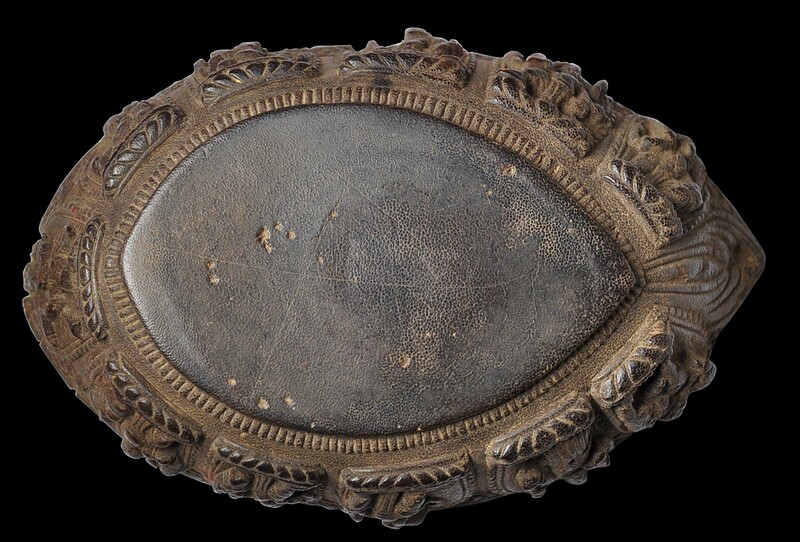 It dates to the 17th century, and indeed is inscribed with a date which approximates to AD 1678. 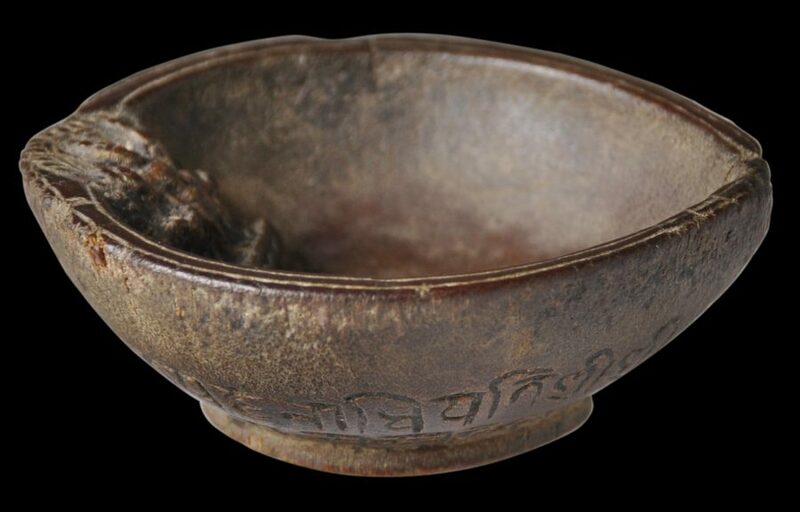 As with the example above, such a cup would have been used to pour consecrated lustral water over religious images. Yoganarendra was the son of Niväsa Malla. 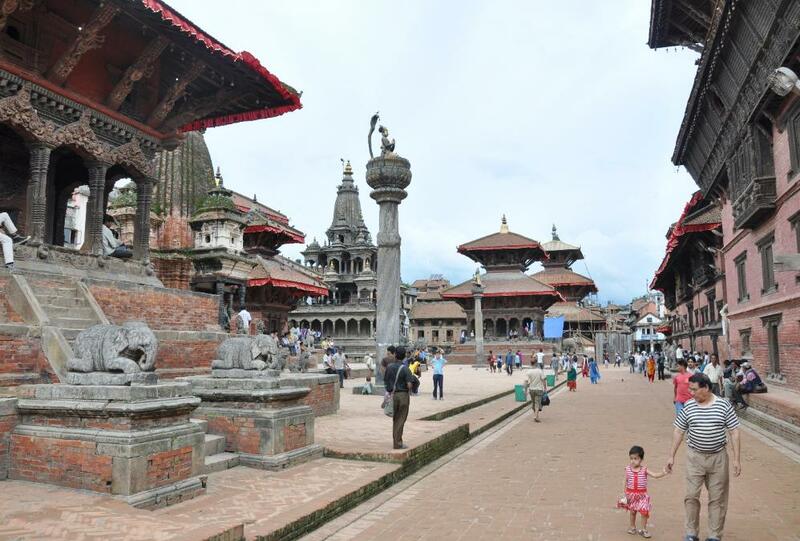 Bother were rulers of Patan during the 17th century. Yoganarendra Malla is the king who is depicted atop the column in Patan Square that is immediately north of the Hari Shankar Temple. 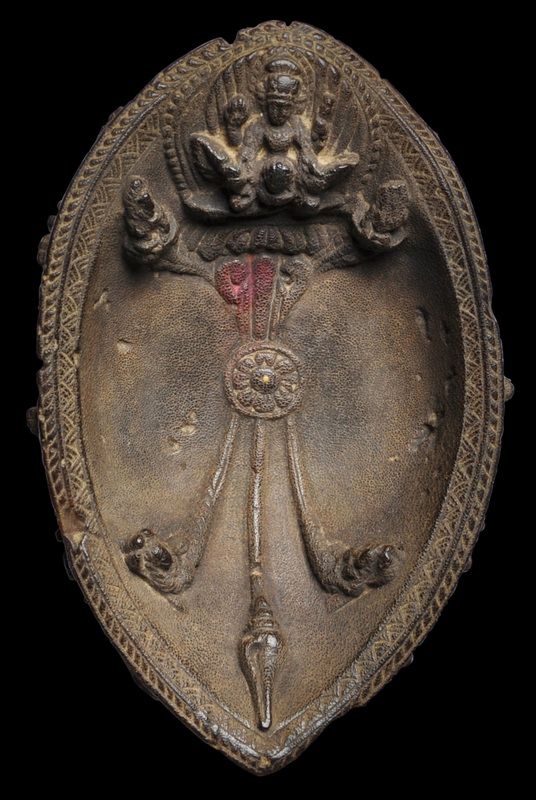 The golden figure of the kneeling king, atop a lotus bud and protected by a large rearing cobra’s hood of a cobra, has been facing towards his palace since the year 1700. 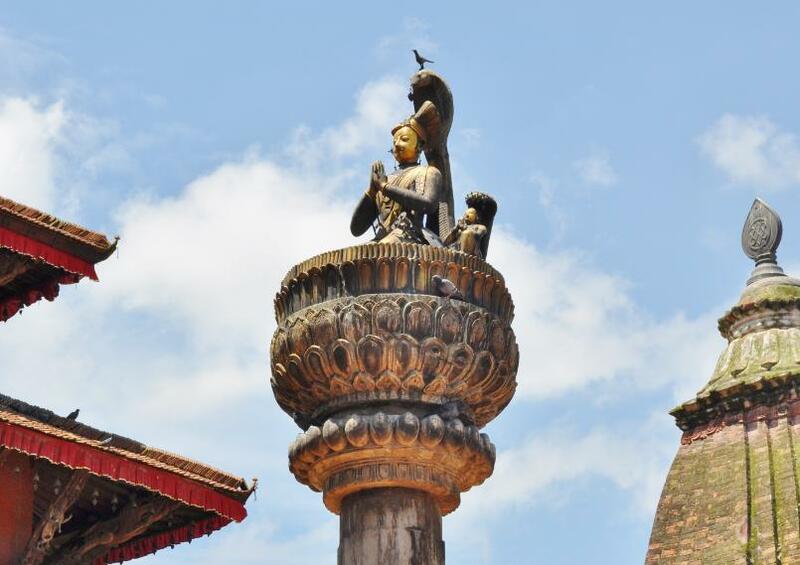 The image of Yoganarendra Malla, the 17th century king of Patan, atop a column in Patan Square. Malla is one of the two kings whose name is inscribed on the smaller cup. Christie’s Amsterdam, ‘Indian, Himalayan, Southeast Asian and Indonesian Art’, April 12, 1994.